TRAM RETURNING FROM LACHFORD, TERMINAL KNUTSFORD ROAD BRIDGE, JUST IN STATION ROAD. OLD WARPS LODGE,GATE HOUSE FOR THE OLD WARPS HOUSE, ESTATE ORIGINALLY, THEN MATERNITY HOSPITAL,NOW RESTAURANT. 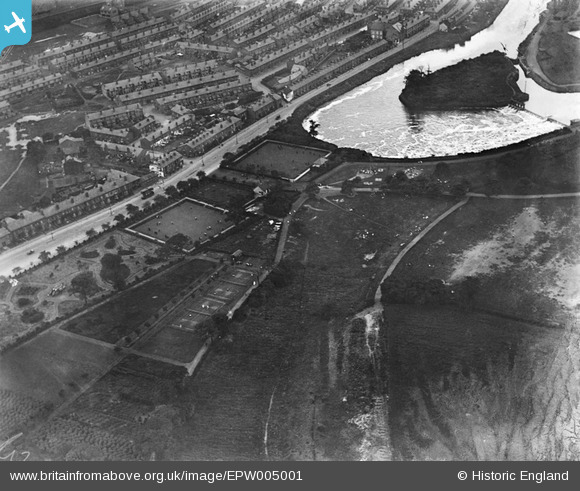 CORNER OF RESERVOIR FOR THE MILL,YOU WOULD GET THREE OF THE BOWLING GREENS IN IT, FUNNY ENOUGH WHEN IT WAS DRAINED AND LEVELED, THEY DID HAVE ONE INIT AT WALTON LOCK END. SLUICE GATES, FOR ADDED FASTER LEVEL CONTROL OF WATER LEVEL. DON'T FORGET THE MERSEY STARTS FROM TWO RIVERS AT STOCKPORT AND A LOT MORE STREAM JOIN IT. WEIR, HIGH POINT OF TIDE, ABOVE THIS POINT WATER LEVEL IS CONSTANT LEVEL FOR NAVIGATION. 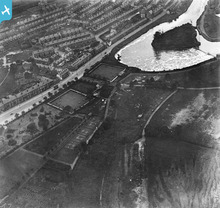 BRICK & TILE WORKS MORE OUT OF PIC, THE CLAY PIT TO MAKE EM IS UNDER HOUSES St MARY'S ST, PARK AV END TO SHREWSBURY ST BOTH SIDES,TRAMLINE RAN FROM PIT UNDER HOUSES PARK AV. World war one tank given to the town by the government in appreciation for the towns war effort.